UMBC alumnus Dr. Jonathan Hu (Ph.D., electrical engineering, ’08) was recently awarded a three-year grant by National Science Foundation to develop new techniques using of chalcogenide glass fiber devices to transform mid-infrared sensor technologies that detect hazardous aerosol particles in the air. 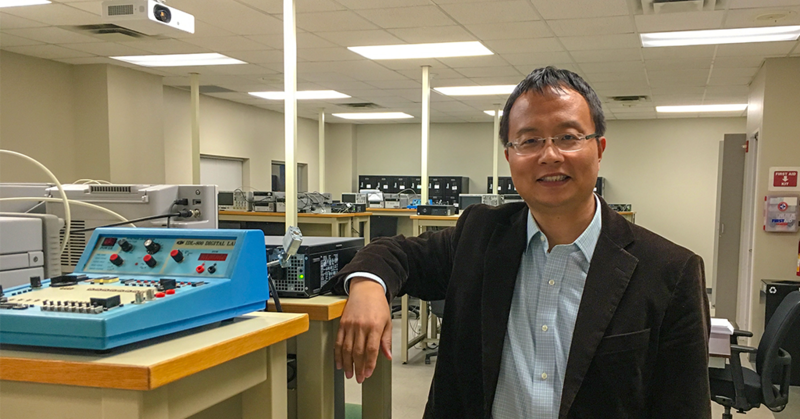 Dr. Hu is currently a tenured associate professor in the Department of Electrical and Computer Engineering at Baylor University in Waco, Texas. Winning a grant from National Science Foundation is highly competitive as only about 10 percent of the applications will be awarded. Dr. Hu also serves as a Baylor Fellow for academic year 2018–2019. The Baylor Fellows Program recognizes professors across the disciplinary spectrum who exemplify excellence in teaching at Baylor University. Baylor Fellows are committed to pedagogical innovation, inspirational teaching, and the cultivation of these among Baylor faculty. Dr. Hu was selected for his effort in connecting research and teaching at Baylor University. He also participated in the transformation of undergraduate engineering education, which was sponsored by the Kern Family Foundation. The UMBC CSEE department is very proud of Dr. Hu, as his accomplishment truly reflects the depth of our graduates and how valuable the UMBC graduate education is for our students in their career path.